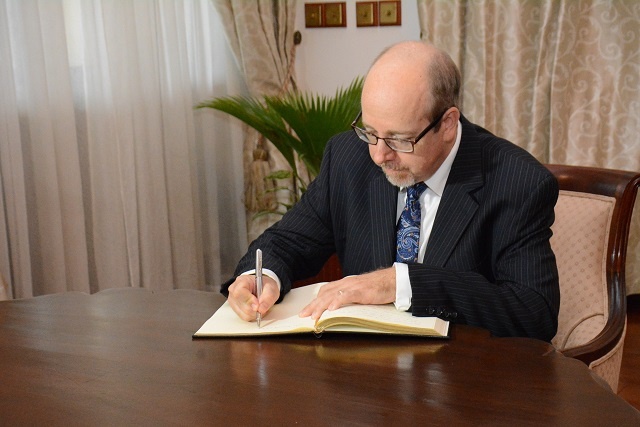 (Seychelles News Agency) - The new Canadian High Commissioner to Seychelles hopes to facilitate linkages between Canada and Seychelles in areas of common interest such as fisheries management and oil and gas development. High Commissioner Ian Myles presented his letter of accreditation to the Seychelles’ President Danny Faure at State House on Tuesday. “I offered the president my assistance to try to facilitate linkages between relevant people, organisations and institutions in Canada and their counterparts in Seychelles and so that they can share information and share lessons,” Myles told the press. The new High Commissioner said Canada is also willing to share its expertise in local elections, as Seychelles, an 115-island archipelago in the western Indian Ocean, will go into district council elections in 2018. “These are things that we’ve experimented with over the years. We’ve made some mistakes but we’ve recorded some success as well,” said Myles. Myles said discussions with President Faure also focused on the United Nations sustainable goals of which both Seychelles and Canada are parties to. These goals have been drafted in a way that makes them as relevant in Canada as they are in Seychelles, and there are many areas of common interest and challenges where the two countries can collaborate, the High Commissioner said. Despite the vast distance between Seychelles and Canada, and the differences in size and climate, the two countries have a lot in common “in terms of shared values around diversity, inclusion and democracy and human rights,” said Myles. He added that the two countries also shared vision for sustainable economy and development. “We look at our natural resources as something that has to be taken care of and measure our success by the impact on our citizens as opposed to just looking at the economy and the figures,” added High Commissioner Myles. Seychelles and Canada established diplomatic ties in 1976. High Commissioner Myles will be based in Dar Es Salaam, Tanzania. Apart from Seychelles, Myles is accredited to three other countries: Tanzania, Zambia and the Comoros. He replaces High Commissioner Alexandre Lévêque.